Houghton Mifflin Harcourt, 9780544409941, 320pp. The best-selling author of Girl Waits with Gun returns with another adventure featuring the fascinating, feisty, and unforgettable Kopp sisters. AMY STEWART is the New York Times best-selling author of the acclaimed Kopp Sisters series, which began with Girl Waits with Gun. Her six nonfiction books include The Drunken Botanist and Wicked Plants. She and her husband own a bookstore called Eureka Books. She lives in Portland, Oregon. For book club resources, Skype chats, and more, visit www.amystewart.com/bookclubs. In addition to her deputy sheriff duties, Constance serves Paterson as the jail matron. How do the expectations and requirements of this aspect of her job compare to those of her work as a deputy? How does each position speak to Constance’s strengths and weaknesses. In an era where women have limited options, discuss how characters like Providencia Monafo, Mrs. Heath, Aunt Adele, and Constance deal with fears and disappointments; how do they each choose to cope? “Deputies follow the orders given to them by the sheriff,” says Sheriff Heath (p240). Those who don’t, he asserts, are called “outlaws.” Do you think Constance is an outlaw according to this definition?What power do titles and labels really have—can one still embody a role without “officially” owning its label? Sheriff Heath goes to great pains to keep Constance’s name out of the papers and keep her from public shame over losing von Matthesius. Do you think it’s reckless of her to pursue the man despite the Sheriff’s direct orders to the contrary? What would you have done in her place? What other “rules” does Constance break (or bend) in her life? When they catch Reinhold, the messenger boy, he exclaims, “Rudy told me to watch for police, but he didn’t say nothing about a lady.” (p234) Many characters focus on women not being able to do what a man can do, but what about the reverse? Identify the advantages, both illustrated in this novel and in general, of having a female law enforcement officer. Much changes once Constance captures von Matthesius. Describe the changes between her and her family. How might things have ended if Constance had not caught von Matthesius? How would his escape influence how you viewed Constance’s actions throughout the novel? “The first line came with such tenderness that it seemed as if it was meant for each one of us,” Constance thinks of the Christmas carol lyrics shared in the novel’s ending. 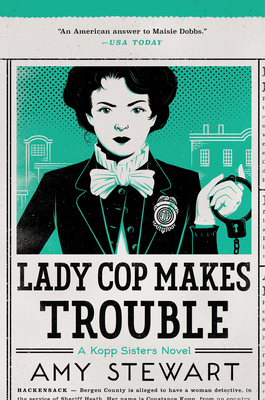 Discuss how they apply to Constance and her fellow lawmen. Why do you think the author chose to end the novel with this poignant moment?